Juvenile Chinook salmon swim in the American River in California. The state’s salmon fishery, which revolves around fall-run Chinook, has been estimated to be worth $1.4 billion, with the fish finding their way into markets and restaurants. The West Coast’s historic drought has strained many Californians — from farmers who’ve watched their lands dry up, to rural residents forced to drink and cook with bottled water. Now, thanks to a blazing hot summer and unusually warm water, things are looking pretty bad for salmon, too – and for the fishermen whose livelihoods depend on them. 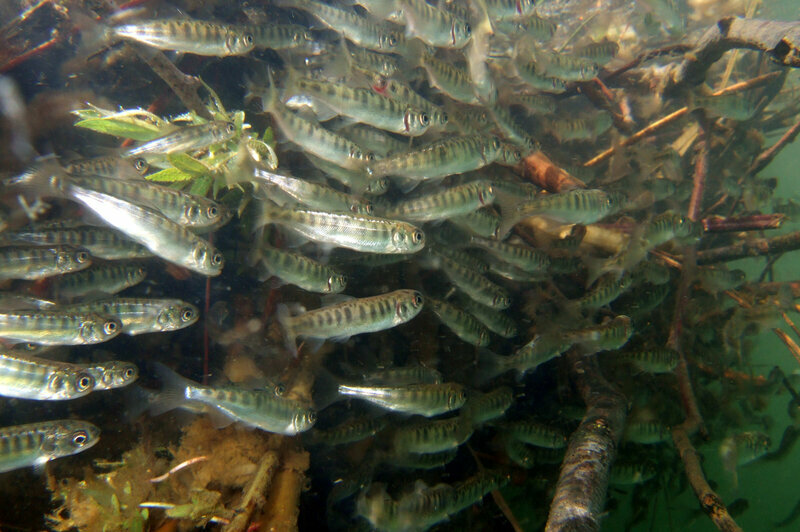 Preliminary counts of juvenile winter-run Chinook are at extreme low levels. These are salmon that are born during the summer in California’s Sacramento River and begin to swim downstream in the fall. 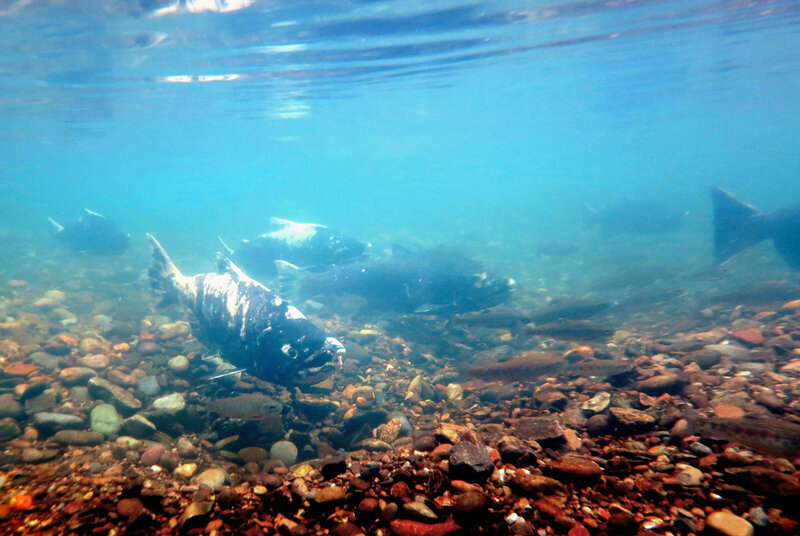 Unusually warm water in recent months has caused high mortality for the young salmon, which are very temperature sensitive in their early life stages. Most years, about 25 percent of the eggs laid and fertilized by spawning winter-run fish survive. This summer and fall, the survival rate may be as low as 5 percent, according to Jim Smith, project leader with the U.S. Fish and Wildlife Service’s Red Bluff office. “That’s not good,” Smith tells The Salt. Worse, it’s the second year in a row this has happened. Most Chinook salmon live on a three-year life cycle, which means one more year like the last two could essentially wipe out the winter run. To protect them, fishing for Chinook in the ocean may be restricted in the years ahead, when winter-run fish born in 2014 and 2015 have become big enough to bite a baited hook. The hope is that the few young fish that survived the recent warm-water die-offs will make it through adulthood and eventually return to the river to spawn. Sacramento River winter-run Chinook are already protected by law from anglers. It’s mostly the Chinook salmon of the relatively abundant fall run — a genetically distinct strain — that wind up in the fish boxes and coolers of California’s commercial and recreational fishermen. The state’s salmon fishery has been estimated to be worth $1.4 billion, with the fish finding their way into markets and restaurants. Chinook salmon swim in the Stanislaus River, a tributary of the San Joaquin River, in California. The trouble is, winter-run and fall-run Chinook — when mingled together in the ocean — are all but impossible to tell apart by eye. In fact, many of the protected fish are almost certainly caught and killed every year. So, when estimated numbers of winter-run fish drop too low, fishing restrictions for all ocean Chinook in certain regions along the California coast may be imposed to protect them. Peter Dygert, a biologist with the sustainable fisheries division of the National Marine Fisheries Service, says fishing regulations for 2016, including size limits and season duration, will be determined at meetings in March and April — and the recent spawning failures of winter-run Chinook will factor into the decision-making. The water supply issues in Lake Shasta haven’t only affected the winter run. Adult fall-run Chinook are currently returning to the Sacramento River to spawn at very low levels, according to Smith. And in 2013 and 2014, meager river flows caused high juvenile mortality of this commercially important fish. The U.S. Bureau of Reclamation is required by federal law to make sure enough cold water is available throughout the year at the bottom of Lake Shasta, a large reservoir at the north end of the Sacramento Valley. This cold water is critical for successful salmon spawning in the river below. For fertilized Chinook eggs, water temperatures in the high 50s and up can be lethal. Temperatures in the low- to mid-50s are more ideal. However, in 2014 and 2015, the bureau failed to meet basic temperature requirements for salmon. Louis Moore, public affairs specialist with the Bureau of Reclamation, says a faulty temperature gauge deep in the lake is to blame. Inaccurate readings, he says, threw off calculations in 2015. That resulted in too much water released from the reservoir early in the season and not enough cold water left later for the benefit of fish. Many in the environmental community are not sold on this story. Rosenfield says the bureau chose to favor farmers over environmental laws, including the Endangered Species Act. Of course, many farmers have been hit hard by the drought. Growers in parts of the San Joaquin Valley have been receiving none of their usual irrigation allotments and have had to resort to heavy use of groundwater — reserves that are becoming seriously stressed. But in parts of the Central Valley, farmers have what are called senior water rights. This means they are last in line to get cut off when shortages occur. Rosenfield says these farmers, including rice growers near where the endangered salmon spawn, experienced only minimal cutbacks in 2015. Even though these farmers have senior rights, favoring them over endangered fish is illegal, according to Kate Poole, a senior attorney with the Natural Resources Defense Council’s water program. She tells The Salt that protecting endangered species is supposed to be prioritized over diverting flows to farmland. John Hannon, a Bureau of Reclamation fisheries biologist, agrees that a miscalculation was made earlier in the year, leading to unfavorable conditions in the cold water supply. However, he says the problems now affecting winter-run salmon have been caused mostly by Mother Nature. “It just didn’t rain enough,” Hannon says. If the drought persists through this winter, Rosenfield believes fish must be provided with generous flows while California farmers, who sold a record $54 billion in crops in 2014, must take one for the team. “Because extinction is forever, and though economic losses for farmers are painful, they aren’t forever,” Rosenfield says.